Gentiana algida in Sierra Nevada. Coast redwood ( Sequoia sempervirens) - in the fog-shrouded coast ranges. 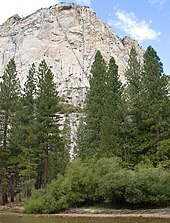 Giant sequoia ( Sequoiadendron giganteum) - in the Sierra Nevada Mountains. Santa Lucia fir (Abies bracteata) and seven other native Abies species. Bigcone Douglas-fir (Pseudotsuga macrocarpa) - Central Coast and Santa Susana Mountains. Valley oak near Mount Diablo. Valley oak (Quercus lobata) - the largest of the oaks. Leather oak (Quercus durata) - an evergreen shrub endemic to serpentine chaparral. 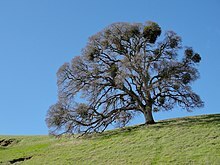 Blue oak (Quercus douglasii) - in the Central Valley foothills and Coast Ranges. California black oak (Quercus kelloggii) - in the higher hills and mountains. Canyon live oak (Quercus chrysolepis) - found mainly in northern mountainous regions. Interior live oak (Quercus wislizenii) in the Central Valley region. Island oak (Quercus tomentella) - endemic with distinctive large evergreen leaves. Engelmann oak (Quercus engelmanni) - an endangered species with a cool blue-gray cast to the foliage. Western blue elderberry (Sambucus mexicana) is found throughout the state, an important host for birds, butterflies, pollinators, and beneficial insects ( integrated pest management). 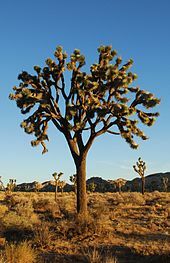 See also: Category:Flora of the California desert regions. California poppy (Eschscholzia californica) are found in drier places. California poppies are also an annual in many places. Monkeyflower e.g. : Mimulus aurantiacus, Mimulus guttatus, Mimulus cardinalis and cultivars. Western blue-eyed grass (Sisyrinchium bellum) and yellow-eyed-grass (Sisyrinchium californicum). Broadleaf stonecrop (Sedum spathulifolium) - San Bruno elfin butterfly host plant. 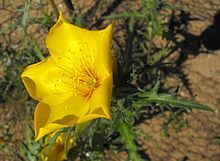 California also has 1,023 species of non-native plants, some now problematic invasive species such as yellow starthistle, that were introduced during the Spanish colonization, the California Gold Rush, and subsequent immigrations and import trading of the 18th, 19th and 20th centuries. 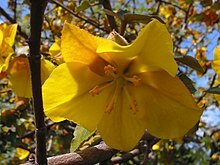 ^ "What is a native plant?". 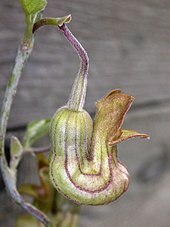 California Native Plant Society. Retrieved 2009-06-02. ^ a b Ornduff, Robert; Faber, Phyllis M.; Keeler-Wolf, Todd (2003). Introduction to California Plant Life. University of California Press. ISBN 978-0-520-23704-9. Retrieved 28 January 2013. ^ "California Floristic Province". Biodiversity Hotspots. Conservation International. Archived from the original on 2008-12-04. Retrieved 2009-06-02. ^ a b Hickman, J.C., ed. (1993). "Appendix I". 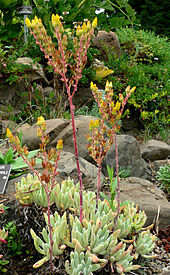 The Jepson Manual, Higher Plants of California. University of California Press. p. 1315. ^ Munz, Philip Alexander; Keck, David Daniels (1 June 1973). A California Flora. University of California Press. ISBN 978-0-520-02405-2. Retrieved 28 January 2013. ^ Bornstein, Carol; Fross, David; O'Brien, Bart (1 December 2005). California native plants for the garden. Cachuma Press. ISBN 978-0-9628505-8-5. Retrieved 28 January 2013. ^ Pavlik, Bruce M.; Muick, Pamela; Johnson, Sharon (1993). Oaks of California. Cachuma Press. ISBN 978-0962850516. ^ Keator, Glenn (1 March 1994). Complete Garden Guide to the Native Shrubs of California. Chronicle Books. ISBN 978-0-8118-0402-8. Retrieved 28 January 2013. ^ Fross, David; Wilken, Dieter (1 February 2006). Ceanothus. Timber Press. ISBN 978-0-88192-762-7. Retrieved 28 January 2013. ^ Keator, Glenn (1990). Complete Garden Guide to the Native Perennials of California. Chronicle Books. ISBN 978-0-87701-699-1. Retrieved 28 January 2013. ^ "Theodore Payne Foundation for Wildflowers and Native Plants". ^ "California Native Grasslands Association". Archived from the original on 8 March 2012. Retrieved 9 June 2010. ^ Crampton, Beecher (1974). 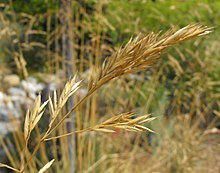 Grasses in California. University of California Press. ISBN 978-0-520-02507-3. Retrieved 28 January 2013. ^ Alden, Peter; Heath, Fred (26 May 1998). Field Guide to California. Knopf. National Audubon Society. ISBN 978-0-679-44678-1. Retrieved 28 January 2013. Ritter, Matt (2018). California Plants: A Guide to Our Iconic Flora. San Luis Obispo, California: Pacific Street Publishing. ISBN 978-0-9998960-0-6. 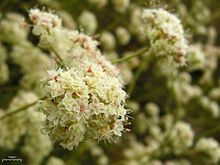 Native Plants for California Gardens, Lee W. Lenz, Day Printing Corp.
CalFlora Database — extensive searchable database of California native plants.